Mandeville will perform at the Harry Dean Stanton Fest Pre-Party, at Green Lantern Bar, 497 W. 3rd St., Thursday, July 12. Doors open at 8:00pm. Showtime at 9:00pm. Tickets: $8.00, available here. Information at https://www.facebook.com/The-Green-Lantern-Bar. Harry Dean Stanton Fest presented by the Lexington Film League. Mandeville is fronted by renowned L.A.-based guitarist-vocalist Jamie James, who once performed in the Harry Dean Stanton Band, and has played with such greats as Steppenwolf, Dennis Quaid and the Sharks, and well as his own longtime group, The Kingbees. James has put together a set inspired by decades of making music with Harry to kick-start this year’s Festival. 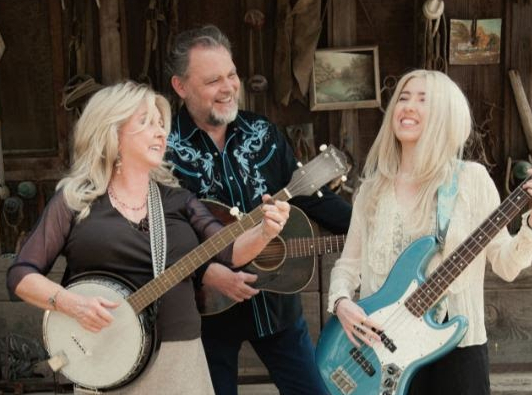 Mandeville also features Peach Reasoner (who fronts Peach and the Almost Blues Band) on banjo and vocals and her daughter, Gina Segall, on bass and vocals. The trio will share some of Harry’s favorite songs in the way that he most loved to perform them: in three-part harmony.